Two years ago, I went to see right in my backyard at the Waikiki Health Center, a Native Hawaiian healer—Auntie Fran. On her door she has a cool wooden sign that says: Lomilomi, La’ua Lapa’ua and Ho’opono’pono. She responded with an all-knowing smile, and started to touch my neck. She manipulated my neck for about two minutes, and said she could feel the tightness. From my mini interview, I learned: Francine Makaonaona Dudoit-Tagupa or Aunty Fran comes from a long line of healers. 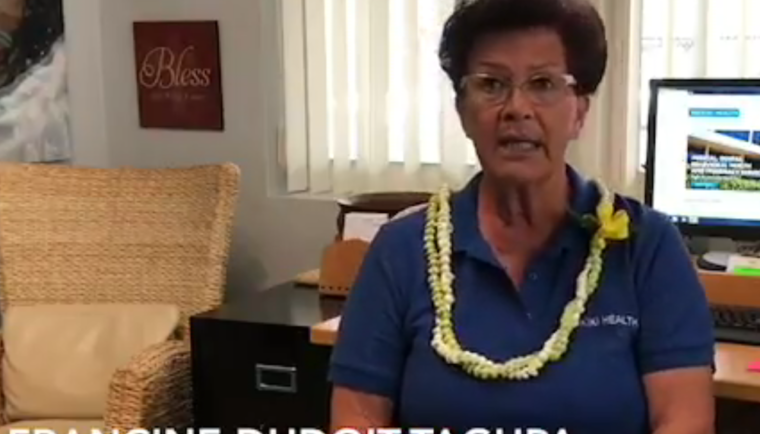 Her grandmother had the healing “gift,” and Aunty Fran grew up on Molokai, day after day, sitting in a room with her grandmother and observing her work with patients. Through observance and transference, she learned the art of Native Hawaiian healing including: Lomilomi (massage), La’au Lapa’au (medicinal herbs) and Ho’opono’pono (conflict resolution). Aunty Fran obviously had the “gift,” as she was able to know what the patients were going to say before they uttered the words. “SUBMERGE YOURSELF, SUBMERGE YOURSELF, SUBMERGE YOURSELF”…I honestly do not know what I am supposed to submerge myself in…possibly a vat full of chocolate or going deeper within. All I know for sure, is that I will dream, and the answers will come.